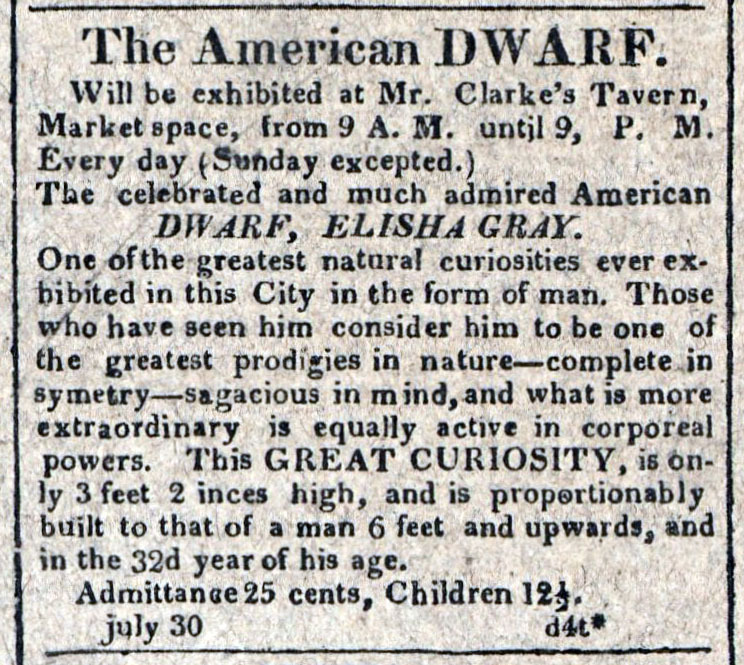 Advertisement: The celebrated and much admired American Dwarf, Elisha Gray. From the journal of Captain Henry Thompson, July 31, 1814. Courtesy the Friends of Clifton. 30 – Very beautiful day, went to Town, din’d with S. Sterett & afterwards rode to see the Frigate Java- Mrs. W. Hollins & Sarah came out in the morning & staid all day – D. Fitzhugh went to Town & return’d in the evg. From the journal of Captain Henry Thompson, July 30, 1814. Courtesy the Friends of Clifton. The first part of these 24 hours commences with light breezes and foggy weather. At 10 PM got the attitude of the moons (Looner) limb. Latitude 47.89 N.
Latter part light airs, at 9 AM got the Foresail unbent to repair it. People Employed in repairing the Rigging. From the journal of Captain Henry Thompson, July 29, 1814. Courtesy the Friends of Clifton. The first part of these 24 hours commences with fresh Breezes from the Westward and Foggy weather. at 8 PM finished the Mainsail and set him, Took in sail. At 8 AM set the studdingsails. At 11 AM saw a large Island of Ice, immediately took in the Studdingsails, as it grew foggy. People employed in duty about the Rigging. No observations this day. From the journal of Captain Henry Thompson, July 27, 1814. Courtesy the Friends of Clifton.